Radiation therapy remains important for the disease control of pediatric intracranial tumors. At present, radiation therapy is indispensable for intracranial germ cell tumors. Pure germinoma is highly curable using only radiation therapy. However, 30-40 Gy of radiation therapy to the whole ventricle or larger field is necessary to prevent recurrence . The life expectancy of patients with a brain tumor is increasing, resulting in delayed complications of radiation therapy becoming more apparent. Endocrine disorders and cognitive dysfunction are the most common complications in long-term survivors . Among patients who received cranial irradiation, 30-50% had an intelligence quotient of less than 70, and 50% developed an endocrine abnormality . Stroke occurred in 4.9% of patients who had survived treatment for childhood brain tumors . Thrombo-occlusive changes frequently occur in cerebral vessels after radiation therapy. In one series, largeartery vasculopathy appeared in almost 20% of patients treated with radiotherapy for optic pathway glioma . In contrast, radiation-induced intracranial aneurysm (RIICA) is a rare complication. A total of only 71 patients with RIICA were reported between 1978 and 2016 [3-11]. They were, treated for primary diseases, including nasopharyngeal carcinoma, pituitary adenoma, and medulloblastoma . Subsequent subarachnoid hemorrhage (SAH) often results in severe disability or death [7,12]. Several patients died of fatal SAH before surgical intervention . Of the patients, the average mean time lag between the radiotherapy and the diagnosis of their RIICA was reported as 12 years . Only 13% of cases of RIICA were discovered during at follow up or were found incidentally . We present a case of repeated SAH caused by a rupture of an RIICA in a patient with suprasellar germinoma treated by radiation therapy 27 years previously, indicating a relatively long lag time between radiation therapy and the diagnosis of RIICA. A 15-year-old woman underwent 45 Gy irradiation in 18 fractions for suprasellar germinoma, under a diagnosis based on imaging without tissue biopsy. She was treated with radiation therapy only, resulting in full response. Subsequently, she suffered cerebral infarctions in the right middle cerebral artery area 22 years after irradiation. 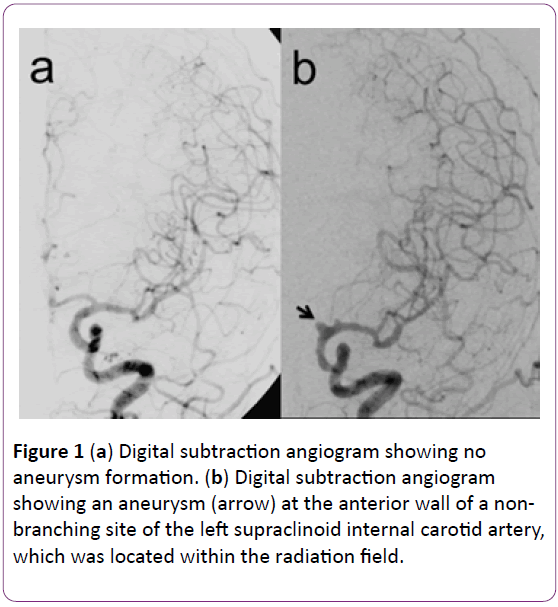 Digital subtraction angiography (DSA) demonstrated multiple luminal narrowing and irregularities, but no aneurysm formation (Figure 1a). The diagnosis was delayed radiation-induced vasculopathy, treated by administration of argatroban. Figure 1(a): Digital subtraction angiogram showing no aneurysm formation. (b) Digital subtraction angiogram showing an aneurysm (arrow) at the anterior wall of a nonbranching site of the left supraclinoid internal carotid artery, which was located within the radiation field. Five years later, 27 years after irradiation, she visited our hospital for severe headache. Her consciousness was alert without focal neurological deficits. Computed tomography (CT) revealed no sign of tumor recurrence, but slight SAH in the anterior interhemispheric fissure. She underwent DSA, which revealed an aneurysm at the anterior wall of the left supraclinoid internal carotid artery (ICA), occlusion of the left anterior cerebral artery, and multiple luminal narrowing and irregularities (Figure 1b). The aneurysm neck was located on a non-branching site between the ophthalmic artery and anterior choroidal artery, which developed within the radiation field. Based on the finding of saccular aneurysm, neck clipping of the aneurysm was attempted (Figure 2a). During the operation, temporary clipping could not be performed because the clip slipped from the proximal left ICA due to radiation-induced severe atherosclerotic presence. Postoperative CT angiography revealed small residual neck of the aneurysm (Figure 3a). Her postoperative course was uneventful, and she was discharged home on the 27th postoperative day. Figure 3(a): Computed tomography angiogram after the first surgical clipping showing the small residual neck of the aneurysm (arrow). (b) Digital subtraction angiogram performed 3 months after first surgical clipping showing enlargement of the residual neck of the left internal carotid artery aneurysm (arrow). Three months after the surgery, the patient was transferred to our hospital by ambulance in a comatose condition. CT demonstrated SAH with left subdural hematoma. DSA showed enlargement of the residual neck of the aneurysm (Figure 3b). She underwent hematoma evacuation for the left subdural hematoma and clipping of the aneurysm. During the surgery, slipping of the previous clip from the aneurysm was confirmed (Figure 2b), and new clips were applied. After the operation, her consciousness improved gradually. Subsequent CT angiography revealed a small residual part of the medial neck of the aneurysm. Thirty-nine days after the second operation, follow-up DSA demonstrated enlargement of the residual neck of the aneurysm (Figure 4a). After repeated failure of surgical clipping, endovascular stent-assisted coil embolization of the aneurysm was performed. However, at the end of the endovascular coiling, residual neck was still observed. Followup DSA obtained 3 weeks after the coil embolization demonstrated enlargement of the aneurysm. Six months after the first coil embolization, additional coil embolization for the residual neck was performed, which achieved complete occlusion of the aneurysm (Figure 4b). She was fully oriented without focal neurological deficits assessed at modified Rankin scale 3. Close follow-up by imaging is in progress. 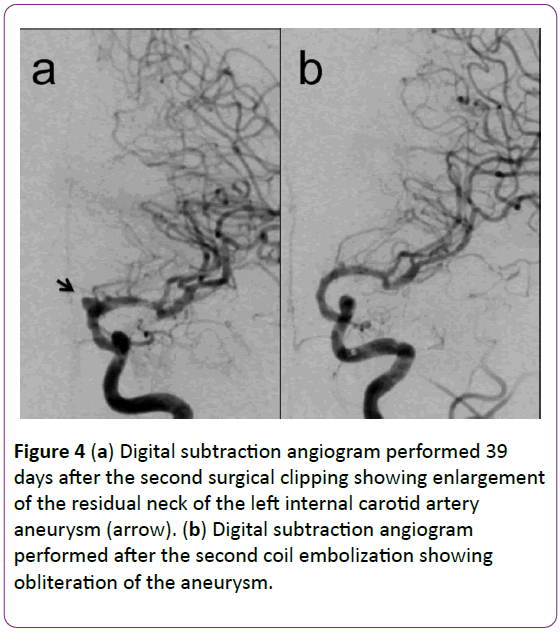 Figure 3(a): Digital subtraction angiogram performed 39 days after the second surgical clipping showing enlargement of the residual neck of the left internal carotid artery aneurysm (arrow). (b) Digital subtraction angiogram performed after the second coil embolization showing obliteration of the aneurysm. RIICA is a rare complication of radiation therapy. In our case, the aneurysm was localized within the radiation field and originated from a non-branching site of the ICA. DSA obtained 5 years before SAH demonstrated no aneurysm formation. These findings suggest that radiation therapy was responsible for formation of the aneurysm. RIICA is a life-threatening complication of radiation therapy . Rupture resulting in aneurysmal SAH occurred in 74.1% of RIICA cases , and the mortality rate was 42.3% . This high frequency of rupture may be associated with weakening of the vessel wall by the effects of radiation . Even a small RIICA is more prone to rupture than other common saccular aneurysms [7,12]. The present case suggests two important conclusions. First, careful follow up at least annually, using both magnetic resonance (MR) imaging and MR angiography, is important to identify non-ruptured RIICA, because RIICA has a poor prognosis with high risk of mortality if the aneurysm ruptures [7,12]. Especially, the patients with germinoma treated by radiation therapy should be paid special attention because they could have full response to radiation therapy and be longterm survivors. Second, treatment for RIICA should aim at complete occlusion of the aneurysm to avoid regrowth and recurrent SAH. Once RIICA ruptures, RIICA could dilate rapidly and undergo repeat bleeding unless RIICA is complete occluded, even if the residual neck is small. This high frequency of rupture and rapid enlargement may be associated with weakening of the vessel wall by the effects of radiation . In this case, radiation-induced severe atherosclerotic change caused the clip to slip from the ICA and neck of the aneurysm. Slipping of clips from RIICA had been reported previously . Consequently, treatment of RIICA requires special attention because of radiation-induced severe atherosclerotic change and the fragility of the arterial wall adjacent to the RIICA. Yen SH, Chen YW, Huang PI, Wong TT, Ho DM, et al. (2009) Optimal treatment for intracranial germinoma: can we lower radiation dose without chemotherapy? Int J Radiat Oncol Biol Phys 15: 980-987. Anderson NE (2003) Late complications in childhood central nervous system tumor survivors. Curr Opin Neurol 16: 677-683. Fujita K, Tamura M, Masuo O, Sasaki T, Yamoto T, et al. (2014) Ruptured internal carotid artery aneurysm presenting with catastrophic epistaxis after repeated stereotactic radiotherapies for anterior skull base tumor: case reports and review of the literature. J Neurol Surg Rep 75: e200-e205. Huh W, Bang JS, Oh CW, Kwon OK, Hwang G (2012) Intracranial aneurysm following cranial radiation therapy. J Cerebrovasc Endovasc Neurosurg 14: 300-304. Mak CH, Cheng KM, Cheung YL, Chan CM (2013) Endovascular treatment of ruptured internal carotid artery pseudoaneurysms after irradiation for nasopharyngeal carcinoma patients. Hong Kong Med J 19: 229-236. Matsumoto H, Minami H, Yamaura I, Yoshida Y (2014) Radiation-induced cerebral aneurysm treated with endovascular coil embolization. A case report. Interv Neuroradiol 20: 448-453. Nanney AD, El Tecle NE, El Ahmadieh TY, Daou MR, Bit Ivan EN, et al. (2014) Intracranial aneurysms in previously irradiated fields: literature review and case report. World Neurosurg 81: 511-519. Tamura M, Kogo K, Masuo O, Oura Y, Matsumoto H, et al. (2013) Formation and rupture of the internal carotid artery aneurysm after multiple courses of intensity-modulated radiation therapy for management of the skull base Ewing sarcoma/PNET: case report. 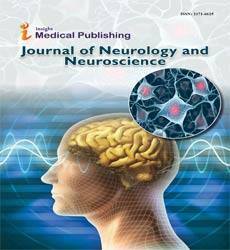 J Neurol Surg Rep 74: 111-117. Tsang AC, Leung KM, Lee R, Lui WM, Leung GK (2015) Primary endovascular treatment of post-irradiated carotid pseudoaneurysm at the skull base with the Pipeline embolization device. J Neurointerv Surg 7: 603-607. Wu H, Guo L, Qui Y, Yuan X (2014) Cavernous internal carotid artery aneurysm after radiotherapy presenting with external ophthalmoplegia. J Craniofac Surg 25: 380-382. Wu YH, Lin SS, Chen HH, Chang FC, Liang ML, et al. (2016) Radiotherapy-related intracranial aneurysm: case presentation of a 17-year male and a meta-analysis based on individual patient data. Childs Nerv Syst 15. Sciubba DM, Gallia GL, Recinos P, Garonzik IM, Clatterbuck RE (2006) Intracranial aneurysm following radiation therapy during childhood for a brain tumor. 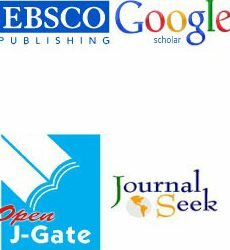 Case report and review of the literature. J Neurosurg 105: 134-139. Azzarelli B, Moore J, Gilmor R, Muller J, Edwards M, et al. (1984) Multiple fusiform intracranial aneurysms following curative radiation therapy for suprasellar germinoma. Case report. J Neurosurg 61: 1141-1145.